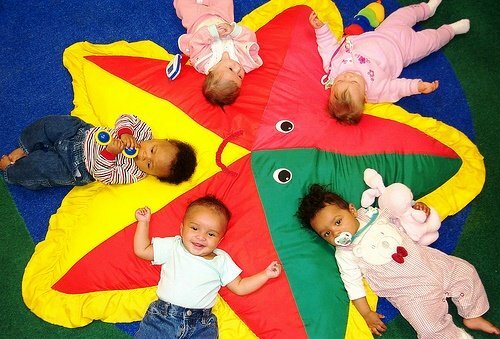 If you’re running a home daycare or even considering starting a home daycare, defining a space is important. It is a must to include areas for activities, exploration, children’s needs, and your family life is crucial. Deciding how to define and better use your space can make having a home daycare business easier for you and the children you care for each day. According to the US Census Bureau, in 2011, of the 32.7 million children in a regular child care arrangement, and of that, 13% are in a home daycare setting. Home daycare facilities come in many sizes, price ranges, and vary in the scope of services they offer to clients. In addition, according to Babycenter.com, licensing requirements vary from state to state, but the gold standard for home daycare accreditation by the National Association for Family Child Care. Acquiring licensing and accreditation is one way to make your home daycare stand out from others, and the internet is overflowing with industry-related websites and forums addressing the questions, trials, and tribulations of starting or running a home daycare business. Some home daycare providers focus specifically on children over the age of one, while others offer care for children from birth to age 5, and others also offer an after-school care option. Another strategy for getting and maintaining clients is showcasing the quality and quantity of services you provide, and through the professional image, you portray. Being able to show parents that your home daycare business offers their children a professional but the homelike atmosphere is very important! To do this, take stock of how your daycare runs on a day-to-day basis and use that to help you decide if your home daycare can benefit from a Screenflex Portable Room Divider. Quickly create a sick child area. Designate a separate infant space to keep children safe from rambunctious play. The designated space is easily accessible and still in the same room with you. Provide a quiet nap area for those who still need a daytime rest break. Create a private area for potty training children, and/or a diaper changing area. A separate area allows you to stay in the same room with all the children and tend to their needs, give privacy to potty trainers and keep other children away from any unsanitary situations. Have a way to display photos, school work, art projects, and important updates. This will keep parents informed during pick up and drop off. Separate your home daycare business from your family space in the blink of an eye! Now that you recognize the benefits of creating new areas by dividing your space, where do you go from here? One of the common questions our customers ask us is: which divider should I use in my home daycare? Our room dividers come in 36 heights and lengths to accommodate any size room. So, depending on the size of your rooms, we have what you need. Our room divider consultants can design a free custom floor plan for you based on your specifications. And Screenflex room dividers lock into place and can even be connected together if you need more length; such as if you need to divide a long basement. Add optional ScotchgardTMProtection and antimicrobial finish for added protection. Room dividers allow you to display photos, school work, art projects, and important parent updates. Consider adding one of our tackable Art Display Tower to your home daycare business. Because Screenflex room dividers are sleek in design they are a perfect addition to your home daycare. Dividers store in a 2′ x 3 size, and fit through a standard doorway. 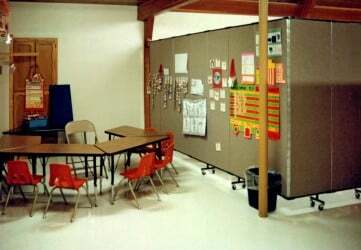 Our Portable room dividers and rolling portable classrooms allow you to create the perfect educational space or divide space for quiet or privacy when you needed. Depending on the size of your space, adding a Screenflex Portable Room Divider or a Light Duty Screen to your home daycare or preschool can help you with creating any of these areas. Most importantly, a room divider allows you to quickly create an instant barrier to store away daycare items when the business day is finished, and quickly turns it right back into your family home! Give one of our room planning consultants a call today at 800-553-0110. They will provide you with our current offers and rebates, and help you find just the right room divider for your home daycare business.